By age 11, Andersen had gained the attention of Norwegian blues guitar teacher, Morten Omlid, who steered him towards traditional blues music. 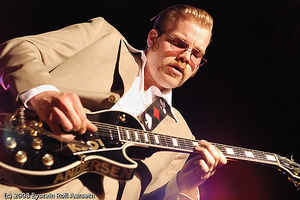 In 2001, at age 21, Andersen moved to the United States, joined blues frontman Terry Hanck‘s band, and quickly became a figure on the West Coast blues scene. In 2013, Andersen was nominated for a Blues Music Award in the ‘Gibson Guitar’ category. In 2014, 2015, and 2016 he was nominated for a Blues Music Award in the ‘Best Instrumentalist – Guitar’ category. During the past 5 years Kid Andersen also gained a solid reputation of musical producer using his own recording facility “the Greaseland Studio”. He produced the last 2 albums of Rick Estrin & The Nightcats: “One wrong turn” and this year “Groovin’ in Greaseland”. In 2017 he also produced several albums including “Stompin’ Ground” from Tommy Castro & The Painkillers as well as Eddie Boyd a blues veteran.